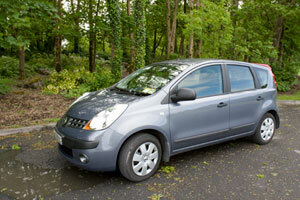 Ireland car rentals are available at all the major airports and at many city outlets throughout the country. You may be trying to decide whether driving is a good option for your tour of Ireland. How on earth do you drive on the left side on narrow Irish roads with a cliff on one side of the road and a stone wall on the other side and no place to pull over? Well, good question. Driving in Ireland is an exciting adventure, to say the least, for those not used to left side of the road and narrow roadways. The first drive away from any Irish airport is rather tense; you may think that there is not room for the oncoming car, truck or tourbus on the road with you. Really, you do get used to driving in Ireland after a little practice. Signposts give place names in Irish and English and give distance in kilometers. The motorways in Ireland have been improved considerably. The main roads between major towns and cities are very nice and in good condition. The highway from Dublin to Galway is two lanes each way and in great condition. The repair and improvement continues. The winding secondary roads are narrow and typically have only a little room at the shoulder, but are in very good condition. Drivers are cooperative with each other. After a little careful practice, you should become more accustomed to the driving in Ireland. I have had enough practice to actually be comfortable on the mountain passes. Really, you will enjoy having your own car so much for the exploring you can do off the main highways, that it is well worth the bit of stress as you adapt. The Irish car rental agent assured me that "thousands rent every year". You can do it, too. The speed limits in Ireland vary depending on whether the road is a major motorway (120 kilometers per hour or 75 miles per hour), a rural national road (100 km per hour or 62 mph), or a local road (80 km per hour or 50 mph). Towns and cities have a limit of 50 km per hour or 31 miles per hour. Main roads in Ireland are patrolled by unmarked and marked police cars. Driving in Dublin and a few of the other major cities is notoriously slow and can be confusing. Parking may also be quite difficult. I have driven in Dublin, though, and if you like to have your own car for day trips, it is handy to rent one. I have opted many times to go to Dublin first without a car, take the train or bus while I'm in Dublin and then rent a car to drive away from Dublin to my next destination. GPS is a wonderful invention and is so helpful. The days of having maps and road signs as your only aid are over. When you check into Ireland car rentals, be sure to find out the cost of insurance. The rental company insurance is quite expensive. Some credit cards provide car rental insurance, but be sure to check whether you are covered in Ireland. I typically use a Diners Club Card to charge the car rental. The insurance was covered, but I did have to give the rental company proof of Diners Club coverage. Be sure to specify automatic or manual for your rental car. Most rentals in Ireland are manual. I prefer automatic, so I can focus on the directions and roadsigns without the added concern of shifting. Book early and look into seasonal changes in rates for the best car rental prices. Have fun touring Ireland!